After lung cancer, prostate cancer is the second leading cause of death by cancer in men. Although the incidence of this cancer is increasing, relatively little is known about the molecular mechanisms involved in the development and progression of the disease. Of note, obesity is associated with aggressive diseases with increased local and distant dissemination. The prostate is surrounded by a fat depot named periprostatic adipose tissue (PPAT) that is, like other fat depots, an active endocrine organ. Clinically, PPAT infiltration by tumor cells is a major histological criterion of poor prognosis in prostate cancer. During local dissemination, this adipose depot appears to be a key emerging actor, although limited data are currently available. We have shown that PPAT, through an original CCR3/CCL7 axis, favors the homing of cancer cells outside of the prostate gland. This effect is amplified in obesity and controls the local dissemination of prostate cancer in vivo (as shown using animal models and annotated collections of human cancers) (Laurent et al, Nature Comm, 2016). These results underline the clinical importance of CCR3 in the progression of prostate cancer in obesity (Patent n° FR 1455491‐ PCTIB2015054550). Once tumor cells have invaded the PPAT, a bidirectional crosstalk is established between cancer cells and adipocytes. We reported that tumor cells induce lipolysis in adipocytes and the liberated free fatty acids (FFAs) are uptaken and stored in tumor cells, without favoring fatty acid oxidation. Indeed, accumulated FFAs stimulate the expression of pro-oxidant enzymes contributing to increased intra-cellular reactive oxygen species that in turns increases the invasive potential of tumor cells. In obese conditions, tumor-surrounding adipocytes activate this signaling pathway to a higher extent and induce further increased tumor invasion in vitro and in vivo. 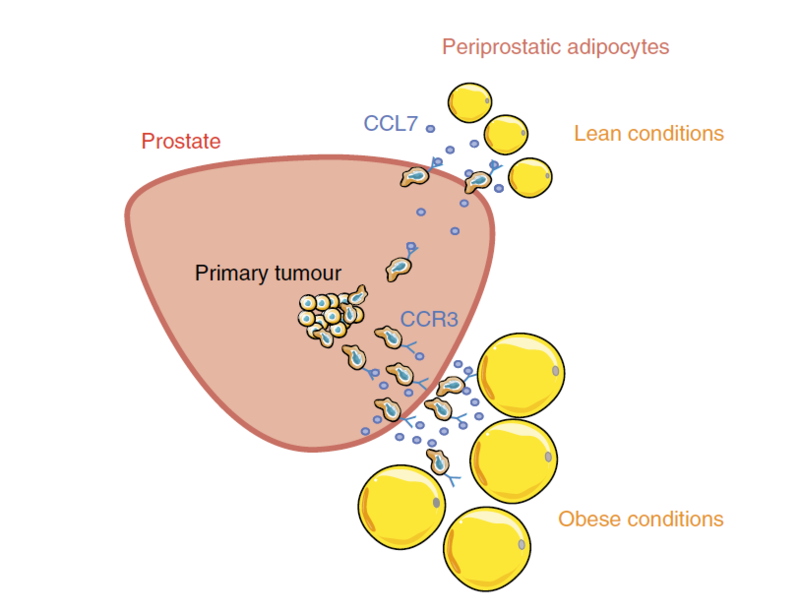 Of importance, human tumor analysis revealed that pro-oxidant enzymes expression is highly upregulated at the tumor invasive front where cancer cells are in close proximity to adipocytes and, this process is exacerbated by obesity, highlighting the clinical relevance of our results (Laurent et al, in prep). Finally, we showed that the CCR3/CCL7 axis is also involved in bone metastasis as medullary adipocytes secrete CCL7, which increases prostate cancer cell bone homing in a CCR3 dependent-manner, and this effect is amplified with obesity (Guerard et al, in prep). Our work emphasizes the key role of adipocytes in prostate cancer local and distant dissemination and proposes new molecular targets for the treatment of obese patients exhibiting aggressive diseases.